After a few years of trial, error, and usenet messages, I know just about all the LaTeX I really need. And my needs are modest. Most of my documents use the same template (tufte-latex), with the same set of packages; occasionally I need to learn something new for a specific purpose, but in general I've got a nice stable skill set. You can probably see where this is going: I'm starting to get bored and starting to feel stagnant. Since I have what I need, the question is: what do I want? And that's my question. I want to expand my TeX skills, but without a real need directing me, I'm not sure where to start. Is there a package, TeX variant, or something that's worth learning just because it's cool? The TeXbook may be your real friend. This beautiful book contains at least 3 books inside: one for beginners, one for intermediate, one for advanced. In fact, there is also fourth book inside, leading to proficiency. Solving miniproblems helps to understand, how it works. It, i.e. TeX. The depth of TeX is as the depth of Faukner's books: the process of discovering new aspects, new beauties or oddities seems to be endless. 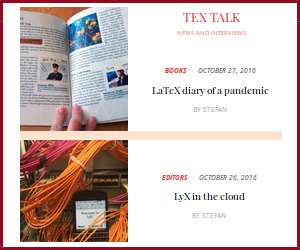 LaTeX is written in terms of TeX, so understanding the latter helps understanding the former. Learning the behaviour of packages is a fun for years. Then TeX friends appear. At least PostScript, PSTricks and TikZ/PGF (about two thousand pages of base documentation in common). And the fun lasts. Let us see haw many people were interested in such questions, as Can we make a love heart with LaTeX?, How to draw a coffee cup, How do I make my document look like it was written by a Cthulhu-worshipping madman?. Enough fun for next ten years? I hope so. What sequence of documents should I read to know “all of” TeX and then LaTeX?